The number of online adults who use Facebook has increased 7% over 2015, meaning that a growing number of people are still joining the site. 76% of Facebook users say they check in at least once a day, up from 70% in 2015. The reality is that social media has enabled our customers to go beyond being passive recipients of our products and services. Our customers are now a community of people who interact with us and with each other. We can choose to collaborate with them or not. We can communicate and learn from them or not. And they can choose to be our advocates, or not. Business owners who recognize this know that social media is no longer optional. In fact, your business is “on Facebook” whether you have an official page or not simply because your customers are already there. So is it worth it to post anything on your Page without putting money behind it? First, the people who have liked your page are most likely to be your most engaged customers. The Facebook platform is an efficient and effective way to maintain a relationship with them so that you remain top of mind. It’s also a great way to test new product ideas and get feedback…for free! Third, if you truly have an engaged fan base, you can use them to create a Look-Alike audience that you can target with ads. These are people who “look like” the fans of your page in terms of their interests and demographics. Because they have similar characteristics to your existing customers, they should, in theory, respond better than a completely cold audience to your ad. Finally, it appears that having a highly engaged Page contributes to the health of your ad account in Facebook. Although Facebook has never verified this publicly (as far as we know) it seems to be logical that they would take into consideration positive and negative signals from your page to determine bid prices for your ads. How Can I Engage with the People Who Have Liked My Page? First, you have to understand how Facebook decides what you see in your News Feed. Have you ever noticed that you see content from the people whom you interact the most with? You see the posts of your funny friend whose posts always make you react by pressing “like.” It’s very unlikely that you’ll see very many posts from friends whose posts you ignore. That is the Facebook Algorithm at work. It’s called “Ranking.” In short, you tell Facebook what you want to see and what you don’t want to see by the way you interact with posts on your News Feed. Facebook takes into consideration the inventory of posts from your friends or pages, how old the post is, and whether you have reacted, commented or shared the post to predict your interaction with new posts. The bottom line is that In order for the people who have liked your page to see your posts, you have to entice them to interact with you and others on your Page. The best way to do that is by posting useful, entertaining, or informational content most of the time. Then when you send out a promotional post, your fans are much more likely to see it. Non-promotional posts are the digital marketer’s way of “priming the pump” and getting their customers ready for the sales pitch. There’s lots of advice about how to achieve the perfect balance of posts. Some social media experts suggest formulas – 20% of your posts ask for a sale, 80% of your posts should not sell, 30% of your posts should be your own content. 70% should be other people’s content. Some social media experts give a laundry list of post types – surveys, questions, fill in the blank… all guaranteed to boost engagement from your fans. But most of these systems are complicated and hard to follow. I know from personal experience and from trying to teach my clients. Figuring out percentages and what’s the most likely to attract engagement is hard. I also knew there had to be a better way to boil down to the essentials for my clients. And then it finally hit me why the other systems were so hard. They focused on the “how” instead of the “why.” It is no wonder that business owners are frustrated with Facebook. Memorizing a social media formula is exactly like memorizing a math formula: it works well until you have to actually apply it in real life. If you don’t know why you’re adding, subtracting, multiplying or dividing, the formula becomes completely useless. Great business strategy begins and ends with why you are doing something. If you don’t keep the “why” at the center of your activities, it’s easy to get off track, veer away from your goals and wonder why you ever started down the path in the first place. 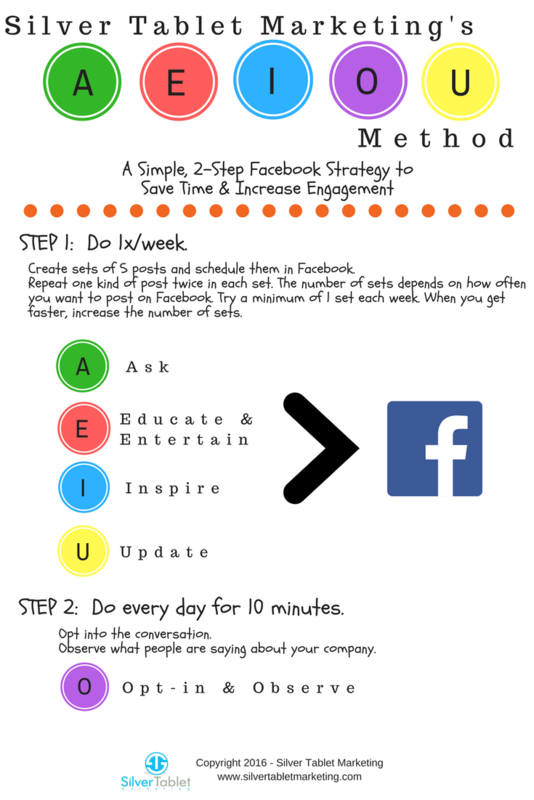 The A-E-I-O-U Facebook Strategy is a simple system that focuses on the 5 most important ways to interact with your customers and prospects. When you follow it, you’re focused on engagement, not execution. You always begin posting with the end goal in mind. In my experience, business owners often fall into one of two categories with social media. They try to sell way too much, or they never sell at all. They either ask for a sale with every post or they don’t ask for a sale… ever. We also forget the very nature of social media allows us to ask many other things of our customers besides sales that are extremely helpful. Social media provides an unparalleled opportunity to gain market research and customer insight that previously cost thousands and thousands of dollars. Facebook gives us an opportunity to get to know our customer outside of our business so that we can be more responsive to their wants. Ask how they are using your product or service. It might be a way you never thought of. The key to asking is to make it as simple as possible for them to answer. So rather than asking an open ended question, ask for a short and specific response. Your most relevant customers and prospects are likely to give you a longer answer anyway. People share things on Facebook that put themselves in a favorable light. People are more likely to buy from companies whose values match their own. Entertaining posts provide the perfect opportunity for your customers and prospects to do both! Think of entertaining and educational posts as “trust-builders.” Your customers can safely dip their toe into the water with you before making the big plunge. People use Facebook as an escape. What better way to take your mind off your day than with a dose of inspiration. Inspirational posts are one of the most shared, viral pieces of content on Facebook. They are easy to digest, easy to “like” and easy to share. Remember, people share things on Facebook that put themselves in a positive light. People like to be inspired and to inspire others. Facebook is not a one way street. It’s important to look for honest feedback about your organization, uncover hidden opportunities and interact. Remember, Facebook gives us an opportunity to get to know our customer outside of our business so that we can be more responsive to their wants. You have to actively look into the window that Facebook opens up and peek inside. Make it a regular practice to read the comments on your page and respond to people who have taken time to post. It’s always great to hear about the things you’re doing well. Although it’s not always fun to hear the negative, it’s a necessary part of improving. Then check on what people are saying about your business off of your page. Type in your business’ name in Facebook’s search bar and see what pops up. You might discover that someone has posted about something that was completely off your radar. If there is something negative, don’t write a defensive comment from your page. Rather, try to take it off line and find out more about the problem so that you can resolve it. Every month, take a look at the profiles of a handful of people who have liked your Page to help fill out your ideal customer profile. Use Facebook to do competitive research. Check your competitors’ Pages to see what they are posting and how their customers are responding. 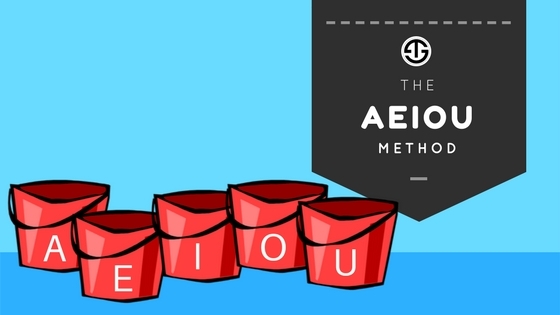 When you use the A-E-I-O-U method, you’re reaching out to your customers and prospects in five different ways. The variety of posts helps you tell your whole brand story, not simply what you’re selling. It also gives your audience 5 different ways to engage with you. When you use the A-E-I-O-U method, the people who engage the most with you are also the ones who are most closely aligned with who you are and what you are selling. You set up a beacon with your posts. Your ideal customers found you and confirmed that you’re exactly what they’re looking for. And that’s the beauty of Facebook. 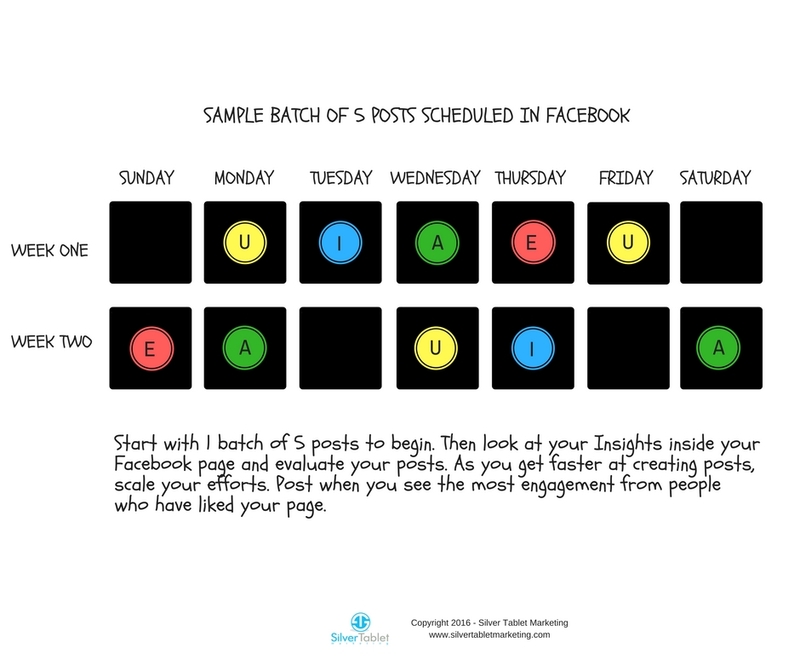 Set aside time each week to brainstorm and create batches of A-E-I-U posts in sets of 5. Batching posts saves time. Creating your posts in batches of 5 with the A-E-I-O-U strategy ensures that your sales posts (A- Ask posts) are 20% of your overall posts and that you’ve engaged with your audience in a variety of ways. Experiment with the timing and number of posts you make. Look at the data in the Facebook Insights section of your Facebook Page a few weeks after you’ve started using the system. You will be able to evaluate which types of posts do the best and whether timing or quantity is having an impact. Start with one set of 5 posts and evaluate. As you get faster, try to increase the number of sets you post each week until you’re happy with the engagement you’re getting from the people who’ve liked your page. Setting up a week’s worth of posts in this manner should take less than an hour of your time. Log into your Page and observe (O) at least once a day to make sure that you’re interacting with your audience. See who is “oohing” and “aahing” about your posts. Opt into the conversation when you can and look for ways to interact positively with other pages and people when they mention your page. Some business owners have added Facebook Groups to their arsenal. Facebook Groups are communities that are built around products, services or topics and are a great way for business owners to attract their ideal clients, provide valuable content to help their prospects and customers overcome their problems and do market research. The biggest difference between a Facebook Page and a Facebook Group is that members of a group can post directly into the News Feed and engage with one another directly. When Mark Zuckerberg made the announcement of the algorithm in January, he did not say that posts from the Facebook Groups that you belong to would decrease. In fact, it seems like Groups do exactly what Zuckergerg wants most – encourages interaction between people. That means it’s critical that if you have a Facebook Group, you make the very most of it. The AEIOU Method can be applied just as well to Groups as Pages! Ready to begin? Download the AEIOU Content Planning Worksheet & Calendar to get started. With areas for planning and execution, It’s like no other Social Media calendar you’ve seen before, and ensures that you focus on the most important things to grow your business. Great information Debbie thank you for sharing! I have been challenged lately with this so it’s very helpful! Thanks so much, Sue. I’m glad that you found it useful.